If you needed another reason not to use herbicides and pesticides in your garden and lawn here’s one: Those weeds you think are such nuisances are actually delicious—and better for you than a lot of the veggies you eat every day. Eating a varied diet is important, but it can be easy to feel like you are falling into a rut with your eating when relying on just what is in season at your local farmer's market or grocery store. Luckily, you can easily expand your food choices by venturing into what grows right in your own backyard. Of course, it's imperative that you research your weeds first to make sure they are safe for consumption. What edible weed options you have available is also dependent on your location and the season. Here are eight popular weeds that are generally safe for human consumption, and moreover, even nutritious! Burdocks are the absolute worst. They pop up everywhere you don’t want them, they’re prickly and stick to everything, and you have to work continuously year-round to keep them at bay. Luckily for all of us, burdocks are also delicious and super good for you. Try peeling and stir-frying burdock stalks (peel them first), or peeling and boiling the root. The plant’s leaves are quite bitter, so you’ll want to boil them first before using them in casseroles and stir-fries. The plant is commonly used to combat skin issues like eczema, as a liver protector, and shows antitumor properties. It’s also high in fiber and protein. Kind of makes you look at this prolific weed a bit differently, no? Chicory grows all over the United States, as well as in Europe and Australia, and every part of the plant provides nourishment. The plant’s roots taste best when boiled, but the flowers can be eaten raw as a tasty snack or as a beautiful addition to your salads. Chicory roots can be ground and roasted before being added to coffee or replacing the morning drink altogether. Take your omelets to the next level by adding this prolific member of the mint family. Creeping Charlie is the scourge of many gardeners because of how pervasive it is; but instead of fighting, it, why not just eat it and get a great source of vitamin C? Immature leaves are delicious raw in salads and on sandwiches or cooked into soups, or teas. Creeping Charlie can also be a fun additive to homemade beer. Dandelions have long been touted for their multiple uses, from promoting healthy skin and livers to making wine. 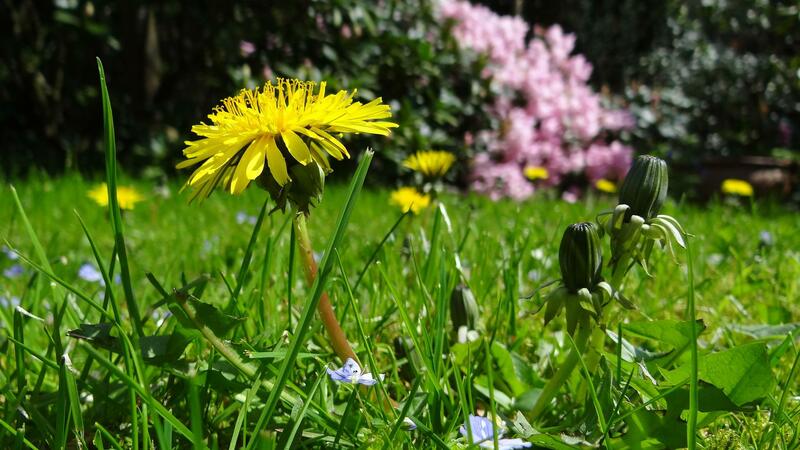 But you don’t have to be an herbalist or chemist to figure out how dandelions can benefit you quickly and easily. Dandelion flowers are completely edible and loaded with beta-carotene. Actually, you can eat every inch of the dandelion plant. Leaves are less bitter when you pick them young, but boiling the greens first will kill off the bitterness. Roots should also be boiled first. Then, you can drink the water as tea for its medicinal properties. Use all the parts of dandelions for stir fries and salads, bread and fry the whole plant, use flowers and leaves as garnishes, or get real ambitious and dry the roots, then roast and brew them as a coffee substitute. At first blush, ground elder is one of the most obnoxious weeds because of how quickly it grows. The plant’s ability to take over a garden plot is uncanny—but before you rip it all out and throw it in a compost heap, consider eating it as an alternative. This plant is delicious when run through a blender for marinades, stocks and soups, or added to salads. The flavor is somewhere between celery and parsley, and health benefits include ground elder's function as an antirheumatic, diuretic and sedative. This invasive plant that’s everywhere in the south (and found as far north as New Jersey) is also totally delicious—just steer clear of the vines. Kudzu root a delicacy in Asian cuisine that chefs serve boiled alongside miso or soy sauce. Use the leaves like you would spinach, and prepare kudzu shoots like snow peas (they taste just like them). The purple blossoms are perfect for making jelly or syrup. The roots, which are high in protein, iron and fiber, can be dried and ground in order to coat foods before frying or as a thickener. The plantain plant is a relative of spinach loaded with iron and vitamins A and C. The weed tastes best when the leaves are young: Just boil cleaned plants until the leaves are slightly softened, or throw them raw into salads or sandwiches. Purslane is nearly impossible to totally get rid of in your garden, but it turns out you shouldn’t even try. The plant (which was one of Gandhi’s favorite foods) is high in calcium, iron, omega-3 fatty acids, and vitamins A and C, and really yummy when added to just about any dish.